June in Buffalo has been an international festival since its inception, attracting composers, performers, and other artists from around the world. Its aesthetic has always been a broad one, where one is likely to hear American experimentalists programmed alongside the European avant garde. It is for this reason, that Josh Levine makes a perfect addition to the JiB faculty, as he is an American composer with significant international ties, and a broadly cosmopolitan aesthetic. While he was born in Oregon, Levine originally trained as a classical guitarist in Basel, Switzerland. He continued his musical studies in the same country as he switched to composition, studying with Balz Trümpy. He later studied at the Paris Conservatory with Guy Reibel, and worked at IRCAM, later returning to the US to earn his PhD from UC San Diego, where he studied principally with Brian Ferneyhough. Since then, his music has been internationally recognized and has received several awards, including First Prize and a Euphonie d'Or at the Bourges International Electroacoustic Music Competition. His works have been commissioned by widely-recognized soloists including Aiyun Huang, Marcus Weiss, and Jürg Wyttenbach, as well as ensembles such as the soundSCAPE Trio, Calliope Duo, Ensemble Contrechamps, and Les Solistes de l’Ensemble Intercontemporain. He currently serves as Assistant Professor of Composition at Oberlin. For Levine, music is a locus where the unity of imagination and memory can be found. The musical work is, for me, a site where the irrational and the rational, the sensual and the conceptual, and, most basically, sound and silence, spar and dance and transcend their seeming dichotomies. Through ever-evolving interpretations of recurring musical materials, I explore the unity of memory and imagination—remembering as an act of imagining, and imagining as an act of remembering. My composing is inspired by movement and the contemplation of change, whether in the physical world or in the psyche. 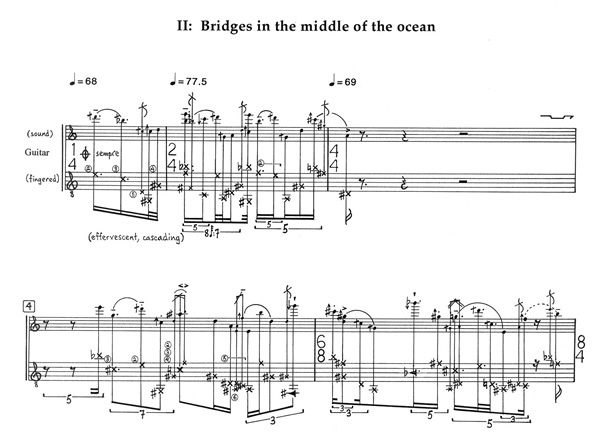 Despite the abstractness of such conceptual imagery, Levine's music is dynamic and rooted in the concreteness of the physical gesture. "The physicality of musical performance and our emotional identification as listeners with its energy, gestures, and implicit drama are among its further driving forces." His early work in the field of electroacoustic music led to an interest in temporal fluidity and harmonic nuance, as well as an attention to detail that seeks to bring "a richer resonance to every moment." 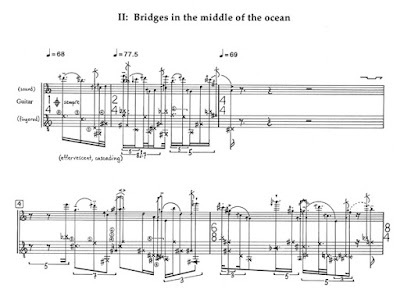 Such temporal and timbral examination can be heard in Levine's recent acousmatic piece, Oneirograph, which uses violin samples as its source material, but pulls open these sounds, finding vast resonant soundscapes within. The piece's title refers to an instrument for measuring dreams—dreams, of course, being another site in which the divisions between memory and imagination become suspect. [The ensemble's music moves in largely homophonic blocks, like forms emerging from a void and receding again for no apparent reason. The guitar does not participate in their creation, but passes between them. As the homophony gradually unravels, the guitar in its turn begins to find openings into the ensemble, eventually (re)discovering there the full sound of its voice. Finally, the Uusinta Ensemble will open their program with Levine's Glimpses (1986), an earlier work which reverses the play of memory found in Former Selves: rather than pulling from previous works, Glimpses consists of material that would preoccupy the composer for years to come—that is, musical ideas that would be continuously remembered. "The listener 'glimpses' moments of parallel musical narratives, aural images whose incompleteness leaves their possible pasts and futures to the imagination. Much of the material is heard again in new contexts, but it rarely seems the same." This work also features Andersson on guitar, who whispers a description of this material during the work's own performance, referring to them as "points of embarkation on a bankless river." As a guitarist himself, it is no surprise that Levine's work often emphasizes that instrument, and as a performer, Levine has performed with the likes of Ensemble Contrechamps, the Basel ISCM Ensemble, the Nouvel Ensemble Contemporain, SONOR, and members of the sfSoundgroup. He has recorded works by Mark Applebaum and Kristian Ireland on the Innova label. I love it when a student comes in to the lesson, puts the music on the music stand, and it may be—in fact, it's almost surely going to be—in a style, or with a particular aesthetic orientation that doesn't correspond to what I personally would write. But it's so fascinatingly done—it explores in such a beautiful way certain ideas, instrumental colors, or sounds that I've never quite explored in that way, and yet that I can empathize with and communicate with both through the score and through my personal relationship to them. There is perhaps no better place for Levine to encounter the varied aesthetic orientations of young artists than at June in Buffalo, and we are excited for the composers who will learn from their dialogues with him, as they reckon with their own imaginations and memories. This year, among the resident ensembles at the June in Buffalo festival will be a Chicago-based ensemble the New York Times has called a "superb contemporary-music collective", Dal Niente. The ensemble's evocative name ("from nothing") comes from Helmut Lachenmann's Dal niente (Interieur III), a work whose "revolutionary style" has served as an inspiration to its members. The name also refers to the group's humble beginnings: initially formed as a collective of graduate composers at Northwestern University, the ensemble's introduction to the international music community was quickly boosted during their Darmstadt residency in 2012, at which they became the first ensemble to be awarded the prestigious Kranichstein Music Prize. Since then, Dal Niente has made it their mission to present new works in ways that "redefine the listening experience and advance the art form", through "immersive experiences which connect audiences with the music of today." They have been quite successful with the latter, as the Chicago Tribune has described them as "a model of what contemporary music needs, but seldom gets, to reach and engage a wider public." Dal Niente are nothing if not active, and have built a reputation for exciting and prolific programming. Some recent projects include "Canciones", a three-week tour of Latin America, including stops in Colombia, Mexico, and Panama which featured four world premieres, as well as the Chicago premiere of Georg Friedrich Haas's in vain, widely recognized as one of the early masterpieces of the 21st century. 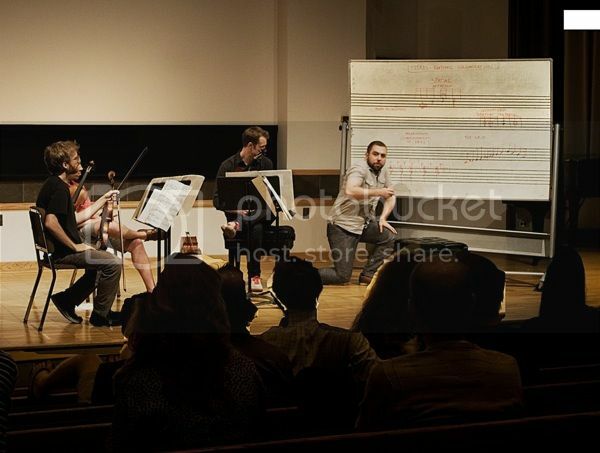 The ensemble's varied concert series have included Proximity Portraits, which seek to introduce local audiences to international composers whose music is rarely performed in the group's native Chicago (a series which has thus far featured music by Andriessen, Ligeti, Stockhausen, and Claude Vivier), and Punks, a project which "celebrates composers whose independent spirit has led to musical experiences that are uniquely original and ambitious in reinventing the art form." The latter series has featured music by Raphaël Cendo and Natacha Diels, and a collaboration with Greg Saunier of the band Deerhoof, who arranged the Deerhoof Chamber Variations for the ensemble. This latter collaboration eventually led to the ensemble's most recent project, a collaboration with Deerhoof for a recording of Saunier's Variations, as well as a new work composed by Marcos Balter. I recorded several passages of instrumental music [which] were then analyzed; not, however, in the ordinary manner […]. Instead, I sought to extract the essence of the color, sound and motion not of these passages in their abstract existence, but of their realization. To find a model in which each individual instrument playing in a precise way is fused together in one global timbre. This global timbre then, once understood, could serve as my new model, to be re-interpreted, re-evaluated and again transformed into a new musical structure. Dal Niente has made educational outreach an integral part of its mission, and have participated in composition workshops and masterclasses at a number of colleges and universities. Since their formation in 2004, the ensemble has developed a particular skill for helping composers realize their visions, whether they be young punks or established masters. This week, we continue our profile series on June in Buffalo faculty artists with Chinary Ung, a composer the Center is excited to welcome to the festival for the first time. 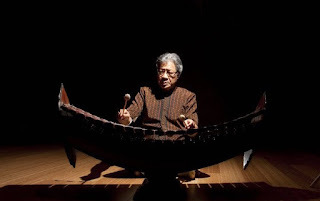 Chinary Ung was born in Takéo, Cambodia, where he studied traditional Khmer music and was a member of the first graduating class of Cambodia’s National Music Conservatory. 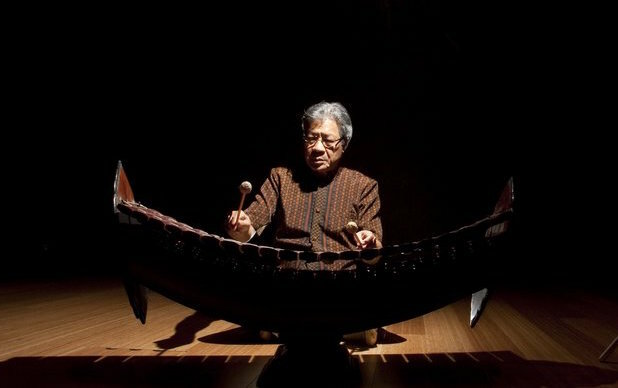 There he became a skilled performer on the roneat-ek, a boat-shaped xylophone of the Pinpeat tradition (used in the ceremonial music of Cambodian royal courts and temples). Ung moved to the US in 1964, to study clarinet with Charles Russo at the Manhattan School of Music. Ten years later, he graduated with a DMA in composition from Columbia University, where he studied with Mario Davidovsky and Chou Wen-chung. Since 1995, he has taught at UC San Diego, where he is currently a Distinguished Professor of composition. Ung has received a number of prestigious honors and awards, including those from the American Academy of Arts and Letters, the Kennedy Center and the Guggenheim, and the Koussevitzky, Ford, and Rockefeller foundations. In 1989, he became the first American to win the celebrated Grawemeyer Award for music composition. Ung has developed a reputation for his organic blend Western harmonic techniques with Eastern melodic accents. The New York Times has said his music bears "an exotic, winding and at times gracefully ornamental character, and its dense textures dance between tonality and atonality. Those who feel terror at the mention of multi-culturalism might listen to some of Mr. Ung's pieces. They show that disparate musical traditions can be combined compellingly." Attendees at June in Buffalo will hear such qualities in a number of performances, such as when Uusinta Ensemble performs 2004's Oracle for pierrot and percussion, a work which takes inspiration from the titular Nechung Oracle consulted by the Dalai Lama before his exile from Tibet (listen here). As a child growing up in a small village surrounded by rice fields, I was exposed to this practice as a part of folk music, and would later hear the music of other cultures share this approach. In contemporary Western music, however, vocalization was most often used as a special effect. I would eventually seek to incorporate vocalization in a more comprehensive manner that was integral to the work while reflecting a similar timelessness and cultural resonance as in the folk music I remembered. [Singing Inside Aura's] notated tempo, forty-three beats per minute, suggests ritual or ceremony, when indeed a strict pulse is audible. The ensemble texture is gossamer, threads combining into fabric. […] The viola and voice parts are inextricable and largely heterophonic, that is, much of the time they’re varied versions of the same melodic line. That line or double line—matched, on occasion, in some of the ensemble instruments as well—is complex in its detail but as a result flexible and organic, like speech or improvisation. Speaking/singing performers also appear throughout Ung's Spiral series, a collection of solo, chamber, and orchestral pieces that currently consists of fourteen works. 2007's Spiral XI: Mother and Child, for solo viola can be heard below, in a performance by Susan Ung. For the composer, according to Greene, "the Spiral series he viewed the concept of the spiral primarily as a means of describing technical processes he had developed for dealing with pitch and large-scale form." At June in Buffalo's final concert on June 12, the Buffalo Philharmonic Orchestra will perform Water Rings "Overture" (1993), a work marked by its expert use of instrumental color and skilled orchestration. Ung has perhaps been most widely recognized for his orchestral writing—the Grawemeyer being awarded to him for his 1986 work Inner Voices, commissioned by the Pennsylvania Council on the Arts for Dennis Russell Davies and the Philadelphia Orchestra. This earlier piece was described by the NY Times as "[overlaying] a richly colored backdrop of 1960's-style orchestral sound color, flecked with exotic percussion, with Cambodian-flavored melodies, most strikingly from the violas. […It's an] evocative and engaging and a genuine contribution toward the serious fusion of Eastern and Western musical traditions." These qualities are still present in more recent works, such as Water Rings, as the BPO's JiB audience will no doubt be able to recognize. We look forward to hearing not only his music, but his insights into composition, orchestration, as well as voices, oracles, and spirals. This week, the Center is excited to welcome back the JACK Quartet for a composer workshop in Baird Recital Hall. 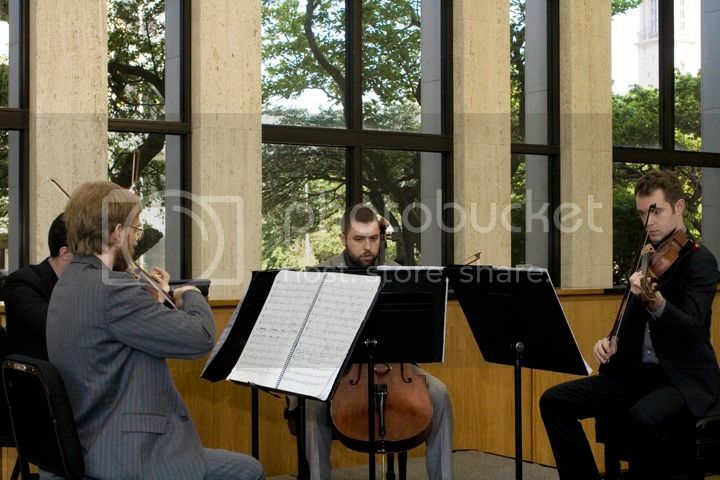 Longtime friends of the Center, the JACK Quartet have taken part in many Center events, beginning with their first residency in October 2009, during which they worked with student composers and presented a concert that featured works by Xenakis, Sciarrino, Robert Morris, and Elliott Sharp. Two years later, the quartet returned with Aaron Cassidy for a joint residency that included a concert featuring the composer's first quartet (and which also included John Cage's String Quartet in Four Parts and concluded with Ligeti's famous second quartet). One of their most memorable performances was a concert at Buffalo's One M&T Plaza which kicked off the 2013 June in Buffalo Festival and Performance Institute. The performance, part of Eric Huebner's "Music in Buffalo's Historic Places" series, consisted only of Morton Feldman's immense 100-minute String Quartet No. 1. This week, the ensemble—tireless advocates of new music that they are—will present a composer workshop, realizing new works by four UB graduate composers: Roberto Azaretto, Alex Huddleston, Nathan Kelly, and Su Lee. Known for their work helping young composers realize their ideas—the Toronto Star described them as the "musical vehicle of choice to the next great composers who walk among us"—the event is sure to be enlightening for composers and audience alike. The members of the JACK Quartet met while studying at the Eastman School of Music in Rochester, NY. Having studied with the Arditti Quartet, Kronos Quartet, and members of the Ensemble Intercontemporain (under the direction of Pierre Boulez), the quartet—consisting of John Pickford Richards, Ari Streisfeld, Christopher Otto, and Kevin McFarland—developed their sophisticated new music chops, quickly becoming one of the most active quartets on the scene. They have collaborated with a number of renowned composers, including John Luther Adams, Caroline Shaw, Helmut Lachenmann, Steve Reich, Matthias Pintscher, and John Zorn, with upcoming performances including premieres by Derek Bermel, Roger Reynolds, Toby Twining, and Georg Friedrich Haas. It's no wonder the Washington Post referred to them as "the go-to quartet for contemporary music, tying impeccable musicianship to intellectual ferocity and a take-no-prisoners sense of commitment."